Not to be confused with Canon EOS 70D, Canon EOS 700D, or Canon EOS 7. The Canon EOS 7D is a professional cropped sensor digital single-lens reflex camera made by Canon. It was announced on 1 September 2009 with a suggested retail price of US$1,699. Among its features are an 18.0 effective megapixel CMOS sensor, HD video recording, its 8.0 frames per second continuous shooting, new viewfinder which offers 1.0X magnification and 100% coverage, 19-point auto-focus system, movie mode, and built-in Speedlite transmitter. 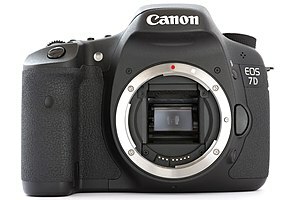 The 7D remained in Canon's model lineup without replacement for slightly more than five years—the longest product cycle for any EOS digital camera. Its successor was the Canon EOS 7D Mark II, announced on 15 September 2014. The 7D has 19 autofocus points arranged in a horizontal diamond pattern. The AF system is a new design which uses a translucent LCD display in the viewfinder. The camera uses TTL 63 zone color sensitive metering system with four variations (evaluative, center-weighted, partial, spot) and exposure compensation of −5 EV to +5 EV in steps of 1/3 EV (±3 EV visible in the viewfinder and top screen, ±5 EV visible on the back screen). E-TTL II flash metering is provided. The translucent LCD can also display guide lines and the spot metering area circle. As with most other video-capable DSLRs, the Canon EOS 7D’s autofocusing function does not work while recording video. Instead, users can only trigger a contrast-detect AF cycle before recording process by hitting the AF button on the camera's rear panel. Users can manually focus the lens during a recording. The shutter is rated to 150,000 shots, and is capable of speeds up to 1/8000 sec, with a flash sync speed of 1/250 sec. The 7D has roughly the same dimension as the older 5D Mark II with an updated button layout. It also features a 100% viewfinder with 1x magnification. The 7D was the first Canon camera with a dedicated movie mode switch, instead of movie recording being done in live view as with the 5D Mark II and 500D. The 7D has dual DIGIC 4 processors and can reach 8 frames per second continuous shooting. When the camera was first released, the buffer throughput allowed up to 94 frames in large fine JPEG mode, and up to 15 frames in raw. Firmware upgrades, most recently in August 2012 (see immediately below), have increased the maximum buffer size to 130 large fine JPEGs and 25 raw files. Corrects a phenomenon in which when using the camera with the EF-S 18-135mm f/3.5-5.6 IS USM or EF 70-300mm f/4-5.6 IS II USM lens, even if lens aberration correction is set to ""Enable"", correction will not be applied. The Canon EOS 7D won the 2010–2011 European Advanced SLR Camera and the Technical Image Press Association Best DSLR Expert awards. The Canon EOS 7D offers the ability to record audio from an external source. Both shutter and aperture are available for manual control, and the 7D also provides multiple frame rate options, including three that match the HD television timing specs. Like most DSLR modes, the Canon 7D neglects endless autofocus during video recording, which is a great concern for advanced amateurs with pros likely to focus manually nonetheless. Separate movie clips that are captured by the Canon EOS 7D are limited to twelve minutes in the high definition 1080p and 720p modes, or 24 minutes in the standard definition VGA mode, depending on what Compact Flash Card is being used. Larger memory cards make for longer video lengths and are available in multiple sizes for the camera. Independent filmmakers often use the Canon 7D as an affordable alternative to digital cinema cameras. The camera was used on the feature films Stanley Ka Dabba, Vazhakku Enn 18/9, and The Avengers. They have also been used on television in the opening title sequence of the 2009 season of Saturday Night Live. ^ a b "Canon EOS 7D Camera - Full Review". Imaging-resource.com. Retrieved 18 May 2012. ^ a b Carnathan, Bryan. "Canon EOS 7D Mark II Review". The-Digital-Picture.com. Retrieved 5 February 2015. ^ a b c "EOS 7D product page at canon.com". Usa.canon.com. 25 May 2006. Retrieved 9 May 2017. ^ "Canon introduces the EOS 7D..." (Press release). Canon UK. 1 September 2009. Retrieved 4 December 2009. ^ EOS 7D Manual (PDF). Canon USA. 4 September 2009. Retrieved 10 November 2009. ^ a b "Canon EOS 7D Camera Video - Full Review". Imaging-resource.com. Retrieved 18 May 2012. 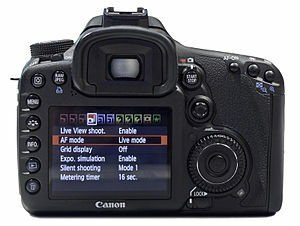 ^ "Canon USA Drivers and Software"
^ "Canon significantly improves EOS 7D with firmware v2"
^ "EOS 7D". Canon.co.uk. Retrieved 8 January 2013. ^ "Canon U.S.A. : Support & Drivers : Consumer & Home Office". usa.canon.com. ^ "Support & Drivers - Canon Canada Inc". www.canon.ca. Retrieved 2 January 2017. ^ PIXMA MP530. "EOS 7D - Canon Canada Inc". Canon.ca. Retrieved 18 May 2012. ^ "Canon EOS 550D, 7D and Legria HF M31 win EISA Awards". Ephotozine.com. 16 August 2010. Retrieved 30 December 2010. ^ "Technical Image Press Association – Award Details". TIPA. Retrieved 29 October 2011. ^ Dutta, Nandita. "You can be adventurous and experimental with DSLR: Stanley ka Dabba Cinematographer". Archived from the original on 27 May 2011. Retrieved 27 May 2011. ^ "NEW ATTEMPT IN VAZHAKKU ENN 18/9". Retrieved 7 May 2012. ^ Laurent, Olivier (May 12, 2012). "Canon's HDSLRs used on set of Marvel's The Avengers". British Journal of Photography. Archived from the original on June 1, 2013. ^ "NBC's Saturday Night Live Shoots Opening Title Sequence In Full 1080p HD Video With Canon's EOS Digital SLR Cameras" (Press release). Webwire. 11 November 2009. Retrieved 23 March 2018. Wikimedia Commons has media related to Canon EOS 7D.